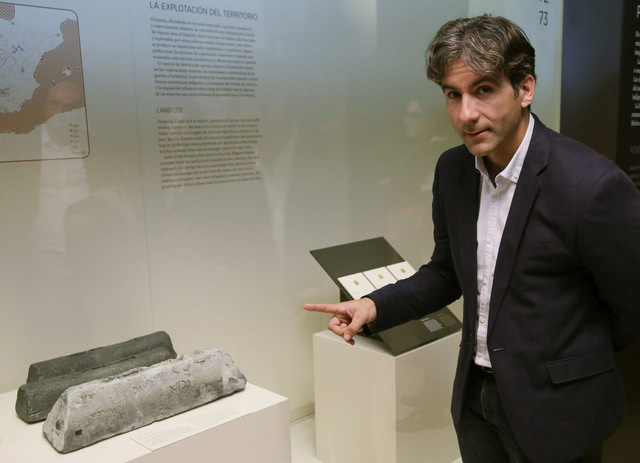 One of the ingots which have been retrieved from the “Bou Ferrer” Roman ship, which was wrecked in the 1st century AD off the coast of Villajoyosa, is now on display in the national archaeological museum in Madrid, reflecting the importance of the wreck in widening our knowledge of Roman naval architecture. Initial interest in the 30-metre ship focused mainly on the amphorae which were on board when the ship went down, since they are known to have been transporting highly valued garum fish sauce to Rome, but a cargo of ingots of lead from the Sierra Morena were also found in the ship’s hold. The results of investigations into these bars have conferred even greater importance on the Bou Ferrer wreck: the ingots are stamped with the legend “IMP. GER. AVG”, showing that they belonged to the Emperor of Rome himself, and it is hoped that future research will establish whether the owner was Caligula, Claudius or Nero. The ingot on display in Madrid is one of 13 which were rescued from the ship in 2012 and 2013, and is the first to be exhibited to the public. According to experts, the letters stamped on it appear to indicate that the lead belonged to the Emperor Nero (54-68 AD) and that the ship was probably built around the year 60, and if this is the case then earlier suggestions that the cargo was being delivered to Caligula (37-41 AD) or Claudius (41-54 AD) can be discounted. During this period of Roman history the Emperors imported food and other goods from outposts of the Empire, including wheat from Egypt and olive oil from Andalucía, but the items found on board the “Bou Ferrer” suggest that the cargo may have been a private one for the Emperor since it contained items of wealth and luxury. The wreck was found off the coast of Villajoyosa in 1999 by two divers, José Bou and Antonio Ferrer, and has since received the surnames of its two discoverers. So far only six metres of the craft have been investigated, despite the structure of the ship being well preserved. However, the number of amphorae recovered is already close to 3,000, and there are hopes that more items of interest are yet to be uncovered.